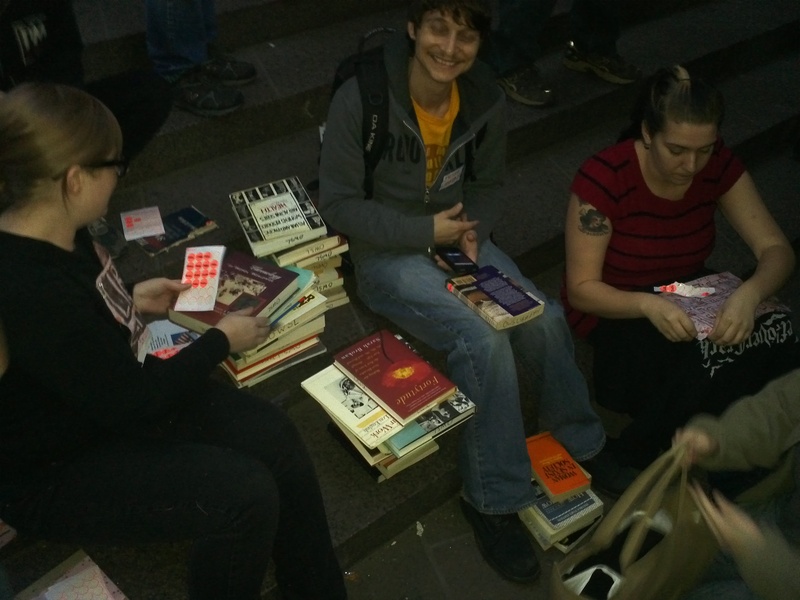 Last night 8-10 members and friends of Rad Ref NYC visited the People's Library at the Wall Street Occupation. We helped process books for the library, which Library Journal says is growing at 30-50 books per day. That's Alycia on the left, an OWS Librarian in the middle, I think Lauren on the right, and my hands on the bottom right. While hundreds of us did our thing in the Zuccotti, a reported thousand more gathered for Kol Nidre services across the street including a cop minyan. It was great to be there for myself, but also as a member of Radical Reference, a collective of library workers and students who like to be directly involved in protests, supporting them and taking place. One member brought up the idea of making a statement, à la PLG in support of the occupation. For better or for worse, that's not what we do. Around our founding, before the Republican National Convention in NYC in 2004 we discussed signing onto a statement of nonviolence, I think it was, and a heated email list argument erupted. We decided, passively or actively, I'm not sure which, that we weren't going to have a structure, a governing body, a central committee, or anything like that, and so have no way of deciding anything as a group. Instead, our focus is showing up. I'm actually rather ashamed that it took us a couple of weeks to get involved as a group. The NYC collective has been rather inactive lately, but perhaps helping with the OWSL library (not "library" as PLG referred to it) will galvanize our efforts. We're planning a question-answering work day the weekend of the 22nd & 23rd (time not set yet), so holler at [email protected] if you're interested in participating. We're also up for heading back down to OWS individually or en masse anytime. #1Submitted by jenna on Sat, 10/08/2011 - 9:21pm. We're marking, stickering, and scanning the books (and DVDs) before handing them over to a volunteer to be tubbed. #2Submitted by Alycia on Sun, 10/09/2011 - 8:21am. Thanks for this report-back, Jenna! I think you capture the feeling at Zuccotti well. I also wanted to add that the library had grown in leaps and bounds since I had last seen it on Wednesday, and the folks who are really doing the organizing work to make it happen (People's Library folks) are really appreciative not only of our help but to have anyone join in who would like to lend a hand--even if it's just five minutes of sorting. This welcoming, appreciative spirit has been one of the best things I've experienced on my few trips to OWS. I've been posting emails about our work to the NYC collective working list, but I'd also like to ask for assistance here in thinking about how RR can continue to help--as local volunteers and distant library workers in solidarity. We've been trying to develop ways that we can help answer questions, and also getting together some kind of remote support for reference q's and supporting the library and the organizers at the Information/Front Desk working group? If folks near and far are interested in helping figure this out, send me a message (my emails are easy to find) or write to any of the RR lists. Finally, one thing that was really useful for us on Friday were flashlights (and bike lights) to aid our work. I think the folks at the library could use donations of more lights, & perhaps batteries for said lights. Sharpies and small round orange stickers would also be useful for the library. This is in addition to the things that OWS could still use at large: blankets, sleeping bags, warm clothes, food, and your support and love.